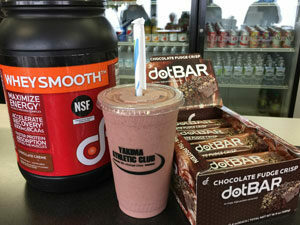 Enjoy a delicious and nutritious smoothie or recovery shake at either of our facilities with our full service snack bar. Our diverse menu with various options and add in's has just what you need to recover and refuel after a life changing workout. Preorder your shake and we'll have it ready for you when you leave. Ask about our loyal customer punch card and our happy hour special! We also carry dotFIT protein bars in a variety of flavors and calorie ranges that make for a healthy choice for your next snack or meal replacement. We also offer additional beverage options and snacks. Our Pro Shop at the Yakima Athletic Club offers high quality logo apparel & accessories such as T-Shirts, Jackets, Shorts, and a variety of Water Bottles. We also carry many convenience accessories to help you if you forget your socks, headphones or ear buds, goggles, etc. Great gift ideas too! At the Yakima Athletic Club we have complimentary sweat towels available to use while you are working out. You may also rent a shower/swimming towel for $1.00 each use. If you like the convenience of having a daily shower towel you can add Monthly Towel Service to your membership for an additional $15.00+ tax per month. You will receive these larger, plush towels each time you visit the club. Yakima Athletic Club offers HydroMassage, a powerful, deep-tissue non-invasive massage that they can enjoy every day with an "Unlimited Massage” membership. HydroMassage is a fully customizable, user-friendly massage system that gives users a powerful, heated, deep-tissue massage in as little as 10 minutes. Users remain clothed and comfortably dry throughout their massage. HydroMassage is a convenient and affordable option to traditional massage therapy. Plus with its interactive touch screen, users have the ability to control every aspect of their experience, including speed, pressure, and the area/s of massage. More and more Americans are realizing the benefits of massage to manage stress and ease the aches and pains. The benefits of regular massage include, improved stress management, decreased muscle tension, increased circulation, decreased blood pressure, and increased range of motion. Until now the cost and time of traditional massage limited many people from experiencing these benefits. Since the Yakima Athletic Club has added HydroMassage, users can enjoy all of these benefits in as little as 10 minutes and at an affordable cost. Yakima Athletic Club offers the Sonnenbraune Wolff system sun bed. Our tanning room features a large changing area and stereo system to enhance your time on the bed. YAC Fitness offers the Suncapsule stand-up tanning system. These units are effective 12-minute tanning systems and we provide you with a comfortable space with room to change.